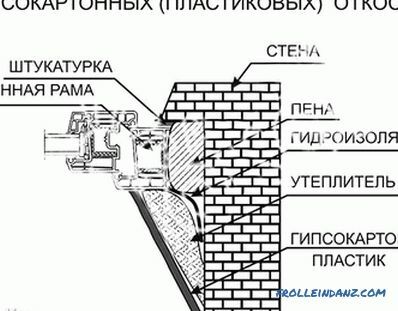 Today, construction works use a variety of methods for leveling wall surfaces, as well as improving sound and heat insulation. 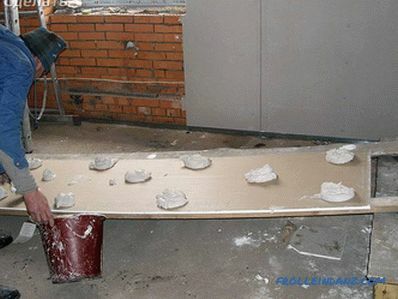 One of the most simple and effective - plasterboard plasterboard (gypsum plasterboard). 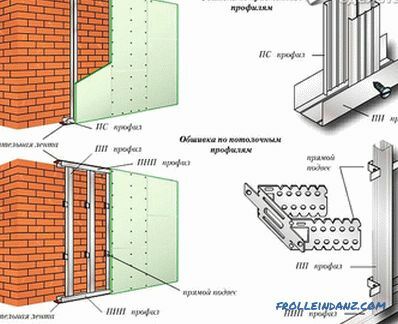 The use of various methods of fastening sheets due to the type of surface, the curvature of the wall and its actual purpose. 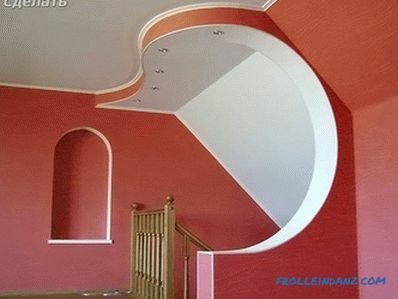 In order to understand all the intricacies of this lesson and answer the question of how to fix drywall to the wall, it is worth finding out some important points. 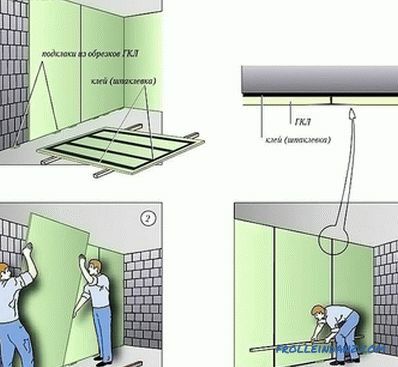 When arranging rooms with a high moisture content (shower or bathroom, plumbing fixtures) it is more expedient to use a special type of gypsum board (GKLV), which has increased resistance to moisture penetration and the formation of fungal deposits. In most cases, these sheets are available in greenish shades. 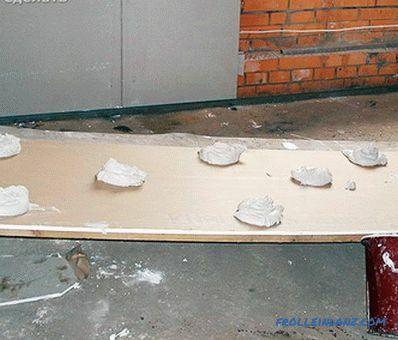 In addition, when finishing rooms with high humidity, you can also use ordinary gypsum board (GCR), but you need to perform a number of protective operations to increase its moisture resistance: painting, priming, or tiling. 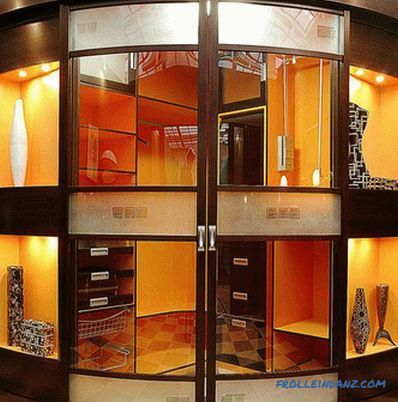 Along with the listed types of this material, there is also fire-resistant drywall (GKLO). It is still the same gypsum, but in this embodiment the base layer is reinforced with reinforcing glass fiber and clay compounds. In sales such sheets are found in pink or red shades. However, along with the advantages, this material has an important significant drawback - fragility. 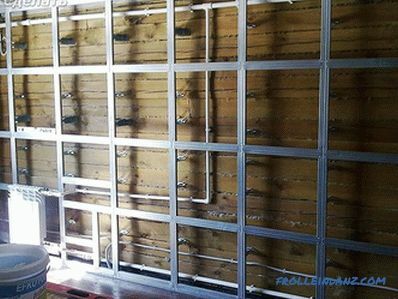 The walls of plasterboard sheets are not able to withstand a lot of weight, so before installing all partitions, consider possible ways of attaching various heavy objects: a plasma TV, microwave, speaker system, etc. 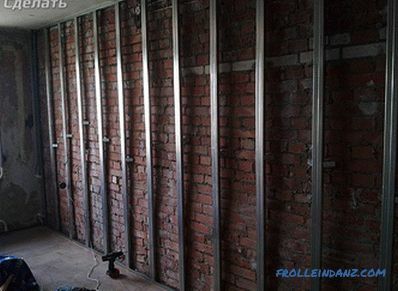 The walls are finished with gypsum plasterboard on galvanized metal guides or by means of adhesive composition. The latter option is more simple and economical, however, it is advisable to use it only with a small curvature of the surface. 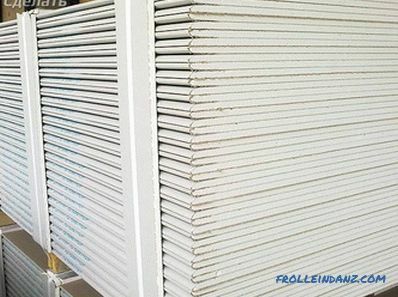 There are many mounting options for plasterboard sheets in order to figure out how to properly assemble, you need to consider the most popular ones: frameless and frame mounting option. 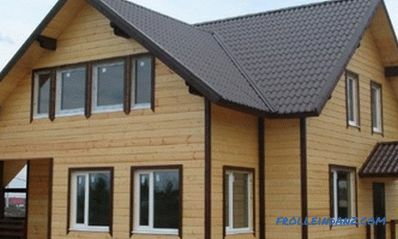 The first method is the simplest, since it does not require the construction of a special frame, in this case the sheets are fixed with a special adhesive. 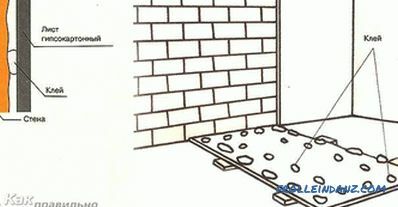 clean the wall from building dirt, dust and other third-party substances. It is more expedient to carry out the variant of fastening with minimal deviations of curvature values. Having finished with the preparatory activities, we proceed to work. 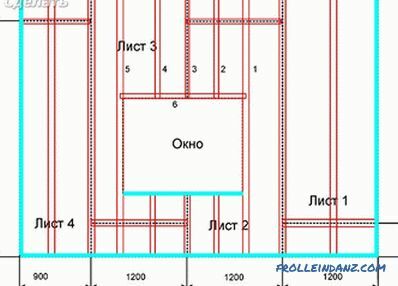 First of all, you will need to take measurements of the wall and outline the future location of the sheets. However, in some cases, with ceiling heights above 2.5 m, it is necessary to dock whole sheets with inserts. Straight cuts are easiest to perform with a paint / clerical knife on the ruler, cutting a drywall sheet on the one hand and breaking off the surplus on the other. Then it remains to cut through the cardboard cover from the rear. Curved or rounded lines are better to do jigsaw / saw with a thin blade. After completing all the cuts, proceed to the preparation of the adhesive. According to the attached instructions for plaster mix pour out all the ingredients and stir the mass. 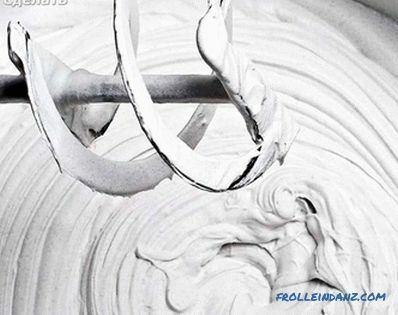 With the help of a notched trowel, the surface of the sheet is covered with a uniform layer of adhesive or a trowel - small cakes. 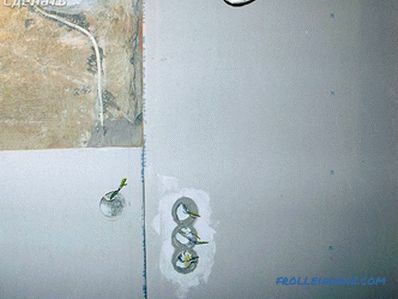 Prepared drywall with a little effort is pressed directly to the wall by the rule. Then with the help of a rubber mallet we knock on the perimeter of the rule, constantly changing its position on the sheet to be glued. After letting the glue dry, we begin to putty the seams and the ceiling gap. An important point when installing plasterboard sheets is to leave the optimal distances between the joining sheets. 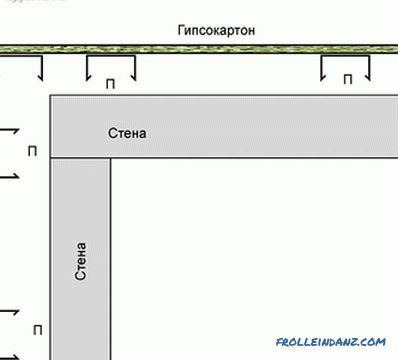 So, between the seams should be at least 5 mm, the gaps from the floor are set depending on the width of the future baseboard and the ceiling at least 5 mm. 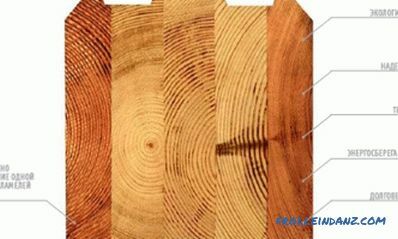 For these purposes, it is convenient to use harvested wooden bars of the required sizes. can be used for insulation of freezing walls. 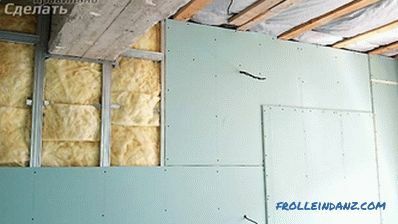 The option of attaching sheets with a profile provides the ability to place connecting cables, wiring and insulation sheets under the drywall. 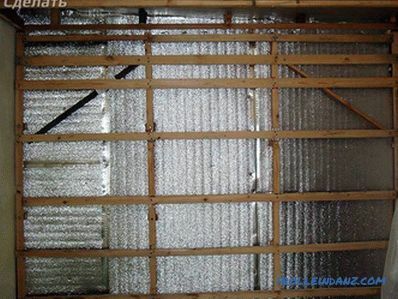 The framework for fixing the gypsum boards can be made of wood (bar with a section of 30 * 50) or galvanized profiles. 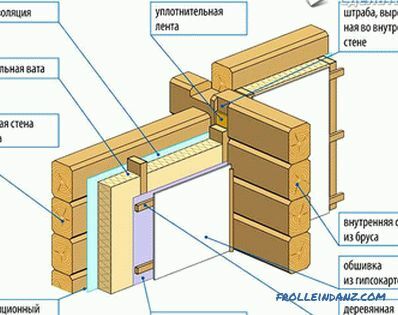 Wooden construction elements are mounted with screws and dowels-nails. 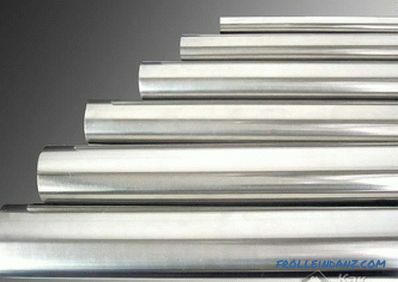 A framework made of wood will cost you a little less; however, it is much easier to work with a galvanized profile, and it is less susceptible to destruction. grinder and shears for metal. 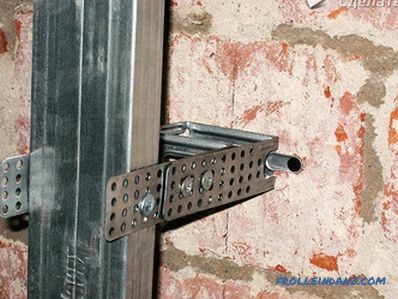 When starting work, you should measure the wall, and identify future locations for suspension mounts and profiles. 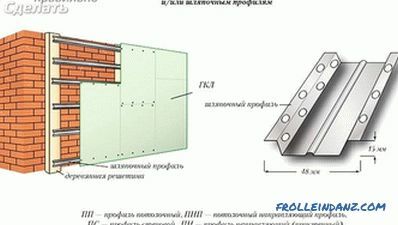 Along the perimeter of the future decoration, guide profiles are placed: to the ceiling, floor and wall, into which vertical profile slats are inserted with an interval of 40 cm and fixed with hangers. Suspended fasteners are placed at a distance of 80 cm one below the other. Then the frame is assembled. We fasten the upper guide rail to the ceiling with a punch and dowel-nails. Then with the help of a plumb we set and fix the lower guide profile. Then, at the specified intervals, the side elements of the structure are fixed and the bearing guides are inserted. The latter are attached to the outboard fasteners with 4 mm self-tapping screws. Getting down to the placement of drywall. 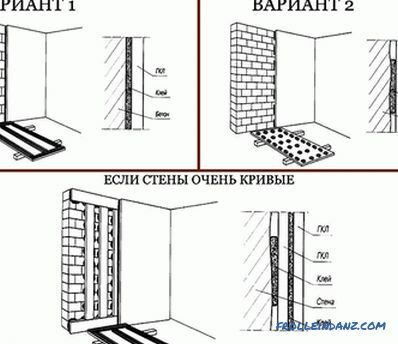 To improve heat and sound insulation, the empty space between the wall and the plates is filled with an isolon or basalt wool. Sheets are attached with 25 mm screws so that the caps are recessed into the material. 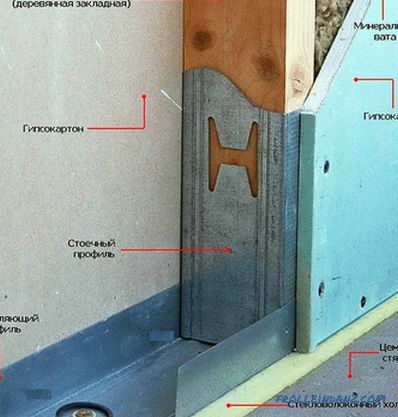 For composite plasterboard sheets, it is important to take into account that under each joint of slabs should be located bearing profile. In addition, we should not forget about the offset sheets. The seams of the obtained surface and the attachment points of the self-tapping screws are puttied upon completion of the installation work. The option of fixing plasterboard sheets to a wooden wall is in many ways similar to work on concrete. Of the features of the installation is to provide a mandatory surface treatment before collecting the structure. 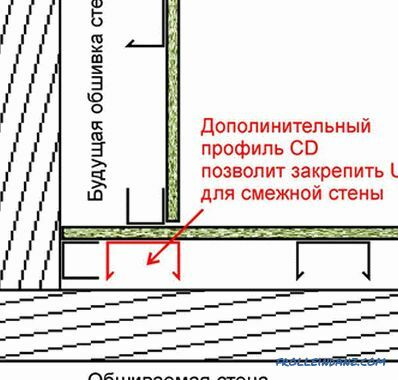 All remnants of the previous decoration should be removed from the walls: insulation, communications and other unnecessary materials. If necessary, an additional caulker is carried out in places where moisture or mold is formed, after which the surface is cleaned and all external defects are removed. Next, the surface is primed with special compounds and treated with antiseptics. 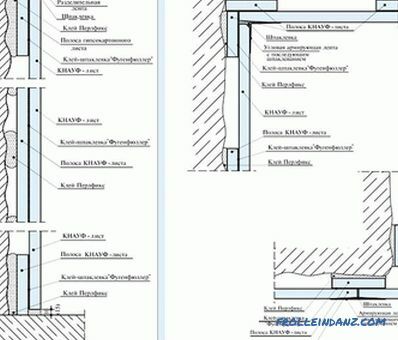 All other manipulations on the arrangement of the batten and installation are similar to those described above. In the course of all plasterboard installation work, it is important to take into account all the proposed recommendations concerning the alignment of the frame and slabs, since this directly affects the service life of the future lining.